A new report suggests that Frances McDormand has turned down the part of playing Joaquin Phoenix's mother in the Joker Origin Movie. Phoenix recently opened up about taking on the project and states that one of the main reasons that attracted him to the role as the Clown Prince of Crime is because it scares him. The actor clearly likes to take chances and be out of his comfort zone, and it appears that Todd Phillips' Joker Origin Movie will do just that, but without Frances McDormand as the Joker's mother. Frances McDormand has yet to follow up Three Billboards Outside Ebbing, Missouri, but it is believed that Warner Bros. is also looking for the actress to play a large part in 2020's Godzilla vs. King Kong. 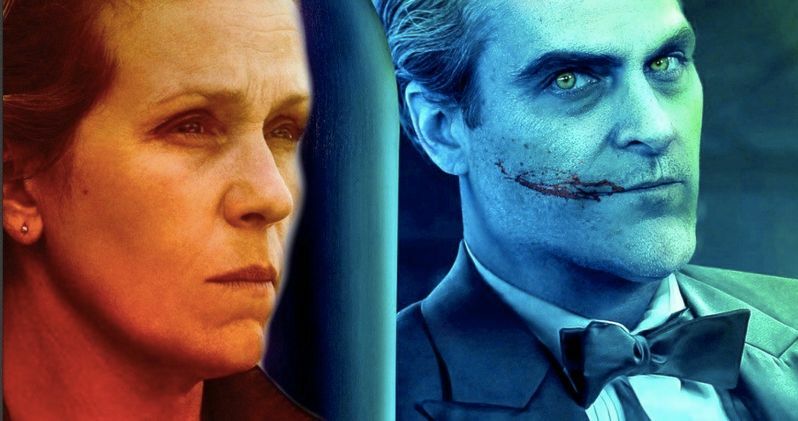 While that news has yet to be announced, McDormand reportedly passed on playing the Joker's mother in the upcoming Joker Origin Movie, which stars Joaquin Phoenix as the iconic villain. No reasons were given as to why McDormand decided against playing the Joker's mom, and she might not have even been asked about the role, since this is an unconfirmed report at this time. Joaquin Phoenix recently revealed that he had an idea for a low budget comic book villain movie a few years ago. The actor stated that he wanted to do a character study on a villain as opposed to a superhero, noting that he didn't even think of the Joker since so many people have already played the iconic villain. Years went by and Phoenix forgot about his idea until the Joker Origin Movie was pitched to him by Todd Phillips, which is practically the initial idea that he had to begin with. Joaquin Phoenix did not take the decision to play the Clown Prince of Crime lightly. He said that it takes him a while to warm up to parts and make them his own, which could very well be the case for Frances McDormand playing the Joker's mother as well. It makes sense that Phoenix needed to take his time before immediately signing on for the Joker Origin Movie, especially since the part has been played so many times before with performances that were praised. Joaquin Phoenix has big shoes to fill in the Joker Origin Movie and DC Films and Warner Bros. are taking a pretty big risk in bringing another actor on board to play the titular character. The rest of the cast is going to have to be chosen well in order to get this story to work. DC fans are already skeptical of another movie that puts the focus on the Joker, so every move is going to be looked at under the microscope by fans. You can read more about Frances McDormand passing on the Joker's mom role below, provided by Umberto Gonzalez's Twitter account. DC NEWS NUGGET: Frances McDormand passed on playing Joaquin Phoenix's mom in Todd Phillip's UNTITLED JOKER ORIGIN movie. They want a name for the mom.